Apple, please do not focus on making an iPhone thinner and thinner. There is a more important area in which developers can show us their innovative ideas. Touch screens like to forward our commands to the operating system but sadly they also like to get dirty. I hate this kind of oily coating compromising your identity with every tap and swipe and coming back in a jiffy after an intense cleaning procedure. That’s why Apple adds a lipophobic coating to the touch screens of iPhones since the 3GS launched in 2009 and their iPads, to repel fingerprint oil. 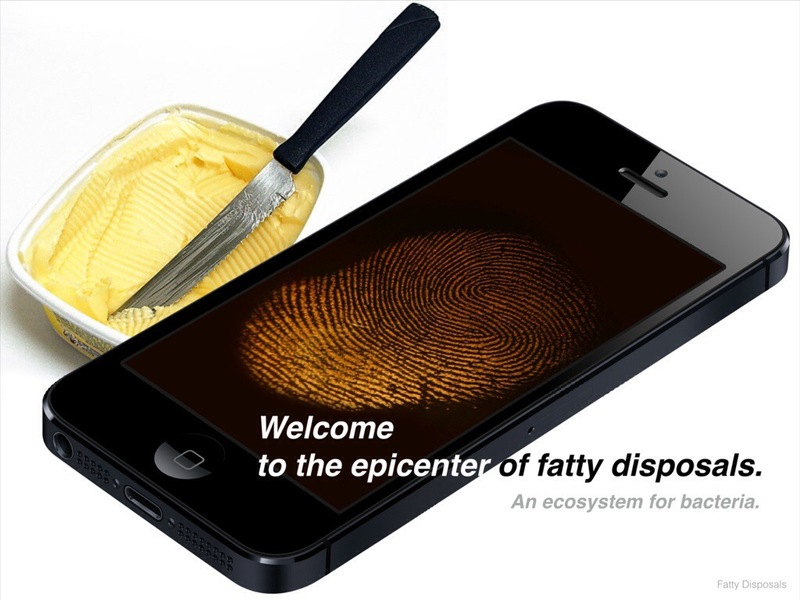 It aids in preventing and cleaning fingerprint marks. Most “oleophobic” coatings used on mobile devices are fluoropolymer-based solids (similar to Teflon which usage is well-known for pans) and are both lipophobic and hydrophobic. 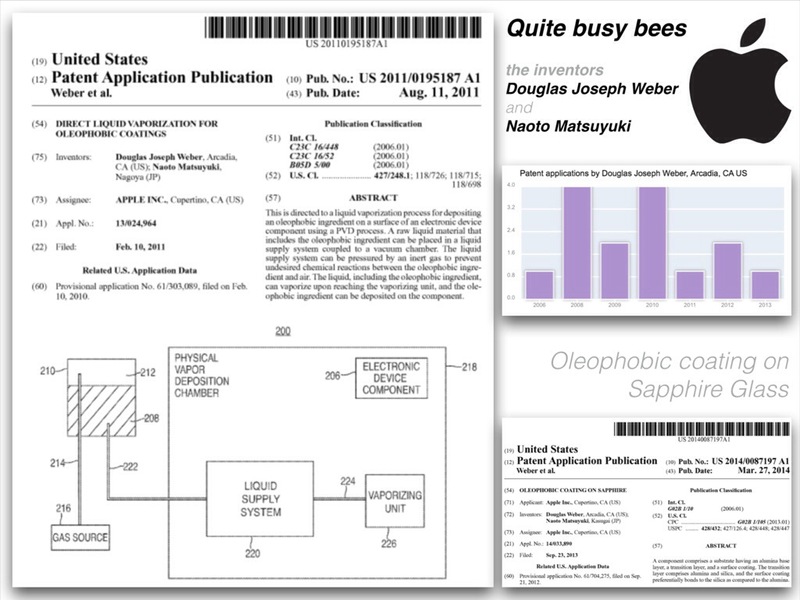 In 2011 Apple filed a patent application to apply an oleophobic coating to the surface of a material and to improve its effectiveness. In particular, this is directed to using a direct liquid application in a Physical Vapor Deposition (“PVD”) chamber to apply the coating to the material. Apple states that as the user touches the surface of a device such as an iOS device, oils and other particles from the user’s fingers could be deposited on the surface. This may adversely affect the appearance of the surface, especially if information is being displayed. One way to limit the amount of oils and particles deposited on the surface of portable devices is to apply an oleophobic treatment to the surface. However, this approach could be difficult to accomplish. I purchased my iPhone 4S in November 2011. iPhones’ touch screens are made of a highly resistant material, Gorilla Glass, which lets the device look beautiful even after heavy usage over years. Gorilla Glass is the registered trademark for an alkali-aluminosilicate sheet toughened glass manufactured by U.S. glassmaker Corning Inc. Engineered for a combination of thinness, lightness, and damage-resistance, it is used primarily as the cover glass for portable electronic devices including mobile phones, portable media players, laptop computer displays, and some television screens. It is manufactured through immersion in a molten alkaline salt bath using ion exchange to produce compressive residual stress at the surface. This prevents cracks from propagating – for a crack to start, it will first have to overcome this compressive stress. I don’t really understand the discussion about Sapphire Glass for touch screens because Gorilla Glass does it all for the majority of users. If the device hits the ground in an adverse angle Sapphire Glass doesn’t prevent the touch screen to get damaged. A really innovative feature would be an oleophobic coating which upholds its properties for a much longer time than the actual coating. My experiences with an iPhone 3GS, a 4S, and a 6 Plus showed that the effectiveness of the coating decreases dramatically after about a year of intense usage. It’s increasingly difficult to clean the screen and you need a very, very clean cloth to get rid of the biological evaporations. It’s like a vicious circle, to clean the screen you press harder and harder and as a result the coating becomes thinner and thinner. Clean iPhone immediately if it comes into contact with contaminants that may cause stains, such as ink, dyes, makeup, dirt, food, oils, and lotions. To clean iPhone, unplug all cables and turn it off. Use a soft, slightly damp, lint-free cloth. Avoid getting moisture in openings. Don’t use window cleaners, household cleaners, aerosol sprays, solvents, ammonia, or abrasives to clean iPhone. The front glass surfaces have an oleophobic coating. To remove fingerprints, wipe these surfaces with a soft, lint-free cloth. The ability of this coating to repel oil will diminish over time with normal use, and rubbing the screen with an abrasive material will further diminish its effect and may scratch the glass. If you let a specialized company replace the touch screen it costs between €70 and €100 in Germany which is equivalent to $90-$130. But there is an alternative. 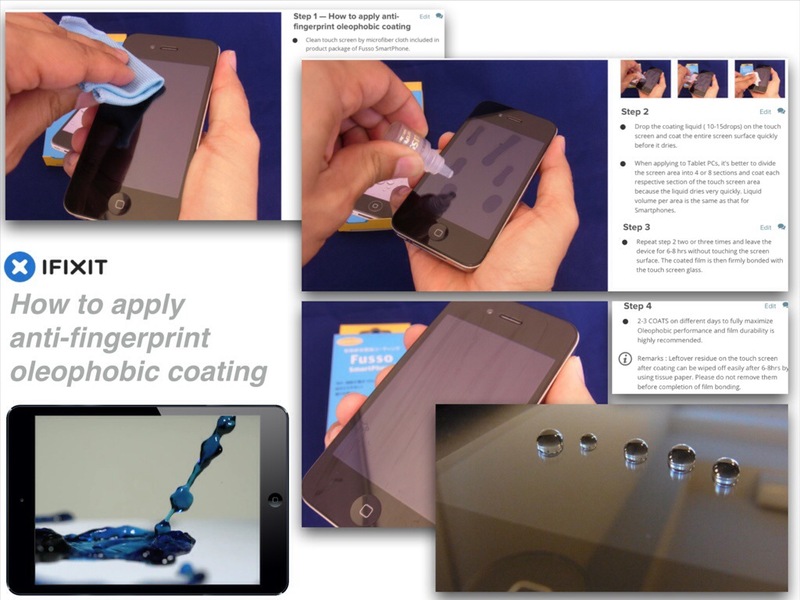 iFixit explains the technique of “How to apply anti-fingerprint oleophobic coating” on its website. This is an easy and cheap way to refurbish an iOS device. But don’t ask me whether it works or not. I didn’t try it out because the original process is much more complicated and don’t believe that this simplified method fulfills my personal quality requirements. Clammy fingers are like brakes when using gestures like drag, flick or pinch. This is what I painfully recognized when visiting Thailand, my second residence, shortly after purchasing my iPhone 4S in 2011. Although the oleophobic coating was straight from the factory it hampered the usage by a ฝรั่ง (phonetic spelling: FARANG, that’s the term Thai people use for foreigners) drastically. Subtropical countries are hostile environments for touch screens of Apple’s mobile devices. Because even Apple cannot redesign the way our body works I personally need an innovative feature implemented in an iPhone, which works like a wiper, a sweat-sensing wiper. I would like to see an innovative approach to the problem of cleaning touch screens but I don’t think that we will see a perfect solution because this feature is not promotionally effective. Before you leave please remove your fingerprints from my website.